Oma likes to start the day with a fruit salad with a bit of cereal sprinkled over it -LOL. 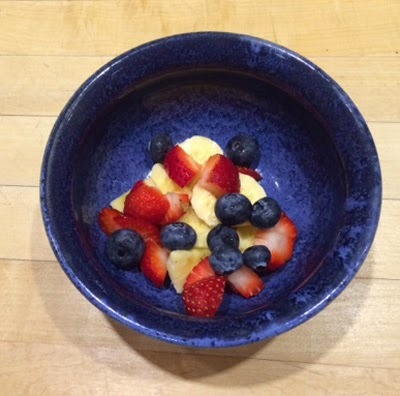 Pictured above is the start of Oma's breakfast; banana slices, strawberries and blueberries. Then the bowl is topped off with some coconut flakes and just a few pinches of cereal. In terms of U.S. fruit consumption, blueberries rank only second to strawberries in popularity of berries. After many years of research on blueberry antioxidants and their potential benefits for the nervous system and for brain health, there is exciting new evidence that blueberries can improve memory. This little super-fruit also packs a serious punch as an antioxidant powerhouse and a disease fighter, among its many other health benefits. The taste and texture of the blueberry are not Oma's favorite - however, it is an awesome fruit to add to our daily juice as well.